With its extremely original design, its 33 mm diameter and its exceptional technology, the Colt 33 launched in 2011 has conquered the hearts and wrists of all women eager to combine aesthetic appeal with high performance. 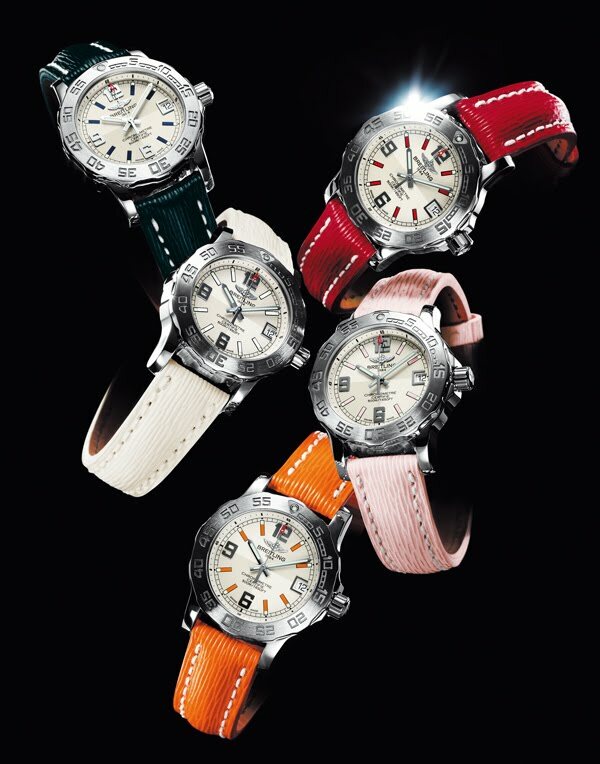 Breitling is now introducing new versions featuring a highly distinctive look. The focus is firmly on the range of refined straps in Sahara leather, recognizable by their embossed motif composed of tiny “dunes” along with a palette of fresh and dynamic colors – red, blue, pink, orange and white – echoed on the dials hourmarkers. The entirely polished case creates a striking contrast that highlights the original shape of the bezel with its satin-brushed surface and its stamped numerals. The glowingly feminine touch may be further accentuated by an optional gemset bezel. The three large 6, 9 and 12 o’clock numerals with their exclusive design and their rounded contours exquisitely punctuate the hours on the finely gridwork-pattern dials. On the technical side, this supersporty model displays all the qualities one would expect from a Breitling instrument for professionals, including a SuperQuartzTM movement ten times more accurate than standard quartz and chronometer certified by the COSC (Swiss Official Chronometer Testing Institute), a scratch-resistant sapphire crystal glareproofed on both sides, a screw-locked crown and a sturdy steel case water-resistant to 500 meters (1,650 ft) – a unique feat for a ladies’ watch. The new Colt 33 with its colorful hour-markers is also available on a triple-link bracelet. This is a collection radiating an unmistakable aura of elegance and performance.